I’m not sure what my favorite part of this bread is, the buttery cinnamon sugar topping or the blackberries and rhubarb nestled in the tender slices. Possibly it could be the whole package that tempts me. My original plan was to go with the recipe and make rhubarb bread with chopped walnuts but these blackberries sort of spoke to me at the market this morning, nothing like a talking blackberry to start your day. I tossed them with the sliced rhubarb in the batter and crossed my fingers. As you can see from the pictures they made small purple explosions in each slice of bread, which I think adds a splash of excitement as well as a just the right amount of blackberry flavor mingling with the rhubarb in my bread. I’m not sure that I captured a good angle that shows off the buttery cinnamon sugar topping but it was a nice sweet slightly crunchy addition to these blackberry rhubarb loaves. I spent most of Sunday afternoon baking, first these loaves and then on to the chocolate sables for this week’s French Fridays with Dorie. This month marks a year that I have been baking and cooking my way through Around My French Table, a cook book that I thoroughly enjoy and can’t praise enough. I looked back on all the French Friday posts that I’ve done here and although I’ve enjoyed everyone of them I do have one regret and that is not being able to share the recipes here, as we (the on-line cooking group) have been asked not to share recipes from the book. I almost always adapt recipes that I find in cook books and I like to share my own adaptions as I make them in my kitchen not a link from somewhere else. I made the cheese souffle, which I adapted from Around My French Table, over the weekend and decided not to post it because I couldn’t decide on a suitable link or recipe to post with it. 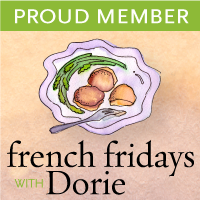 So, this is my dilemma with French Fridays with Dorie, I enjoy cooking and sharing with the group but I also like sharing the recipes I make. Of course this has nothing to do with my Blackberry rhubarb bread post today but about the direction I want to take here with the sharing of my recipes. In a medium bowl combine the flour, baking soda and salt, set aside. In the bowl of a standing mixer mix together the brown sugar, oil and egg until well blended. Beat in the buttermilk, vanilla and flour mixture. Stir in the rhubarb and blackberries. Spoon the thick batter into the loaf pans. Blend the melted butter, cinnamon and sugar together and sprinkle in clumps (it will spread while baking) over the top of the batter. Bake for 55-60 minutes or until toothpick inserted in bread comes out with a few crumbs. Let cool for 5-10 minutes before removing from pans, continue to cool on a metal rack. Patty, your bread looks gorgeous! Cinnamon, blueberry and rhubarb sounds like a heavenly flavor profile. If I can get my hands on some rhubarb, I'll definitely give this a go! Patty que hermoso pan adoro las moras muy buena combinación con ruibarbo,absolutamente maravilloso,abrazos hugs,hugs. Hi lovely lady, what a great recipe for the fruit bread. My mouth is watering just by looking at your amazing photos..very very yummy! Thanks for sharing and I wish you amazing Monday!!! I adore rhubarb and your bread looks absolutely divine! Just wish I had a slice this morning with my coffee. This is on my list to make! Have a great week Patty!! What a great combination of ingredients for this bread! Looks gorgeous too! I love a good quick bread – They're so diverse with the ingredients you can add, and the times of day you can enjoy it! This looks just wonderful, Patty. Love the rhubarb and blackberry combination especially. Very creative! I really like blackberries in baked goods, but I've not tried rhubarb before thanks for the recipe I should look for the pretty red stalks. This looks absolutely beautiful and I adore this combination. I love rhubarb – my Mom always makes a rhubarb cake in the Summer. Your bread looks and sounds delicious – love the blackberry and rhubarb pairing! Such a pretty bread, Patty! A slice of this for breakfast (or dessert!) would be perfect! The whole package of this bread sounds awesome! Being a non baker myself, having this kind of special bread with choice of ingredients you like is like a special treat (compared to what I can buy from pastries shop). I have a lot to learn and I want to be able to make something like this one day. Thanks for the recipe and I'm keeping it! Lovely presentation and I like how you put all the colors in the photo. Patty, this is a delightful combination that I never would have thought of! Isn't fun that there are infinite numbers of delicious ingredient combinations? We can be cooking till the cows come home and never run out of new recipes and ideas! Love this! I can understand your dilemma about the AMFT. Part of the fun of what we do is being able to share making a recipe our own. Either way, I like coming here. I love rhubarb and blackberries. This bread is the perfect combo of flavors! Yum! This bread looks & sounds amazing! Great photos, as always! Wow. I don't even know where to start! All my favorite things in here including rhubarb and buttermilk. As for AMFT… I'm guilty of sharing many of the “recipes”…but usually its because I am adapting them and when I do I don't copy them word for word but rewrite them into my own voice. You adapt and interpret a lot too so I wouldn't feel too badly if I were you. Besides, its not like Dor invented Cheese Souffle! Patty, your bread looks divine. I love the combination of blackberry and rhubarb – a combination I wouldn't have thought to try. yay! this is perfectly good. just looking at it make me feel hungry, so yummy!. Oh, what a fabulous combination!!! And the topping is just more deliciousness! YUM. And I totally agree with you on the FFwD dilemma…many times I can find that Dorie has already shared the recipe, but not lately. “Nothing like a talking blackberry to start your day”–HA HA HA! Your beautiful bread is talking to me, too! Love it! Gotta find me some rhubarb! Blackberry and rhubarb…a fantastic combination! And the cinnamon sugar topping…mmmm..just heavenly! Patty, This bread looks and sounds incredible! I have to bookmark for when my blackberries come in! Yum! This bread looks so wonderful. I have a gift of rhubarb from a friend (Can't grow rhubarb in AZ), enough for a pie and something else. Your bread is inviting me to try it…thanks for sharing this recipe. Love the combination of the blackberry and rhubarb addition in this beautiful and delicious bread, Patty. What a lovely slice of bread to have with morning coffee, or a nice hot cup of herb tea! Oh yum! I love rhubarb in bakery and he addition of the blackberries sounds wonderful. Wow, the blackberries and rhubarb is such a unique combination, and the topping is awesome. This is a must make! This is such a beautiful bread. I love the color and honestly I can taste it just by viewing your photo. Can't wait to try this. I am a recent convert to the awesomeness that is rhubarb. Your bread looks perfect and your photos are wonderful! I love the look of this loaf. What a delicious combination of flavors! Can't wait to try this recipe. What gorgeous bread, Patty! I will have to give this a try when my rhubarb is ready! This looks wonderful, Patty. I feel the same way about the FFwD recipe dilemma.